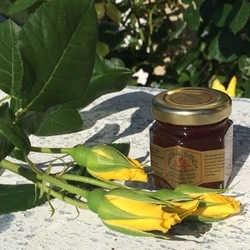 Beekeeper's Blend is a consistently rich middle range amber honey. It can used for all applications where you would choose honey as a special ingredient. It is blended from seasonally available honeys from California, West Coast to the Midwest. Since California is experiencing a significant drought, we are fortunate to be able to combine these rich natural honeys to create a perfect honey blend.